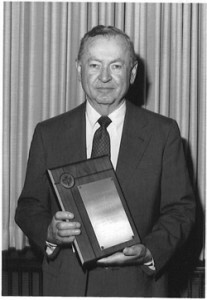 Joe Naumes is pictured here in 1982 receiving a memento from the Oregon State University School of Agriculture, honoring him for his leadership and contribution to the industry. 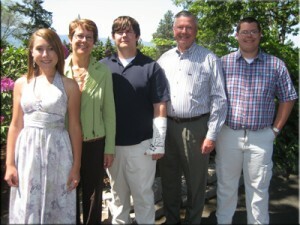 Mike and Laura Naumes and their triplets, Joe, Cynthia and Sean: All three children attended St. Mary’s School in Medford, Oregon, where they were involved in various academic achievement programs and were active in athletics. They recently graduated and are all three accepted into prestigious universities out of state. Cynthia and Sean will be attending Santa Clara University in Santa Clara, California and Joe will be attending Saint Mary’s College, a private college located in Moraga, California. Mike currently serves as Chairman of the St. Mary’s Community Foundation and was formerly Chairman of the Board of Trustees. Laura currently serves on the Board of Trustees at St. Mary’s School. Sue Naumes: Sue is enjoying retirement, but is still actively involved with the Naumes Family Foundation, as well as many other community-based projects. Sue sits on the Board of the Carpenter Foundation and is a member of the Walker Advisory Committee, two local foundations that each distribute in excess of $1 million each year. And although she has retired she continues to serve on the Medford Irrigation District Board and the Rogue Basin Water Users Council Board. As a member of the smudgepot crew, Sue and her four cohorts raise money for the Arts and art organizations in the valley through the sale of recreated smudgepots. 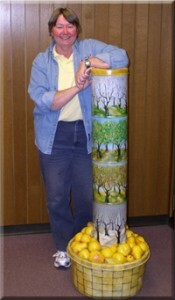 Recyled orchard heaters are painted by local artists and then auctioned at a gala event to benefit the Craterian Performing Arts Theater, The Rogue Gallery and Art Center and the Art in Bloom Festival. Sue reports that her fruit label collecting hobby (pears, apples and citrus) takes up a good deal of her time and provides an excuse for travel to Washington and California. In addition, she has taken up several new pursuits, including woodworking and dog agility. Sue says that her young Airedale Terrier, Quincy (yes, named after the Quince root stock and fruit), absolutely loves agility and is only held back by her slow, clumsy owner.